Combine this with the wealth of restaurants, bars and places to shop that have sprung up in the area and you get a neighborhood that perfectly combines the commercial with the recreational. Of course, river views are one of the biggest draws to the neighborhood, and Battery Park City doesn't disappoint. Its beautiful Esplanade runs for 1.2 miles affording views of the Hudson and the Statue of liberty with New Jersey in the distance. This part of Manhattan may not have historic brownstones, but it more than makes up for it with luxurious eco-friendly condos. Battery Park City Apartments often come fully equipped with concierge desks, parkside garages and onsite gyms, while high-rises offer views of the Esplanade and Hudson River. A third of the land is given over to public parks creating the perfect balance between the commercial and residential. Technically Battery City apartments are built on land owned by the Battery Park City Authority so instead of paying New York Real Estate Taxes they are subject to PILOT or 'payments in lieu of taxes.' These pay for things like the landscaping of the park and waterfront maintenance. New York's newest residential neighborhood was originally an artillery battery used by the Dutch in the 17th century. Its strategic position at the meeting of the East and Hudson Rivers led to it becoming industrial dockland, but by 1950's the once prosperous area had fallen into decline with many dilapidated shipping piers. In 1966 Governor Nelson Rockefeller announced a proposal for what would become Battery Park City and soon after created the Battery Park City Authority to oversee development. They adopted a master plan devised by the architectural firm Cooper-Eckstut in 1979, which perfectly married commercial, retail and residential space. 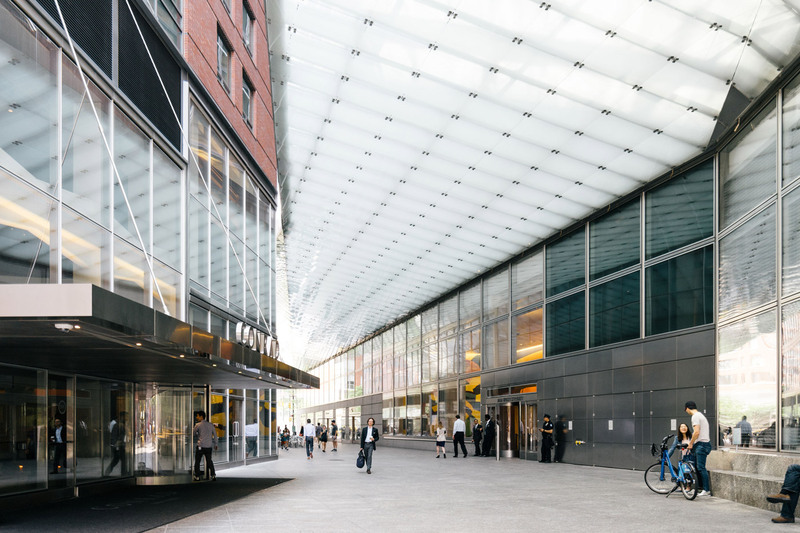 Gateway Plaza was the first complex constructed, followed by the World Financial Center (now Brookfield Place). New environmental guidelines developed in 1999 by the BPCA created an eco-friendly neighborhood filled with modern condos and high-rises. With an increasing amount of bars and restaurants serving the area, it continues to grow and evolve today. The Esplanade runs the length of Battery Park City and has stunning views of New York Harbor, Ellis Island and the Statue of Liberty. The upper walkway is reserved exclusively for the use of pedestrians , while the lower walkway is open to cyclists, skateboarders, and rollerbladers. Gardens line the route, and when you reach North Cove, it opens into Esplanade Plaza where a volleyball court is open during the summer months. North Cove Marina at Brookfield Place has regular boat trips out into the harbor including a Sunset Sail and a Champagne Brunch Sail. 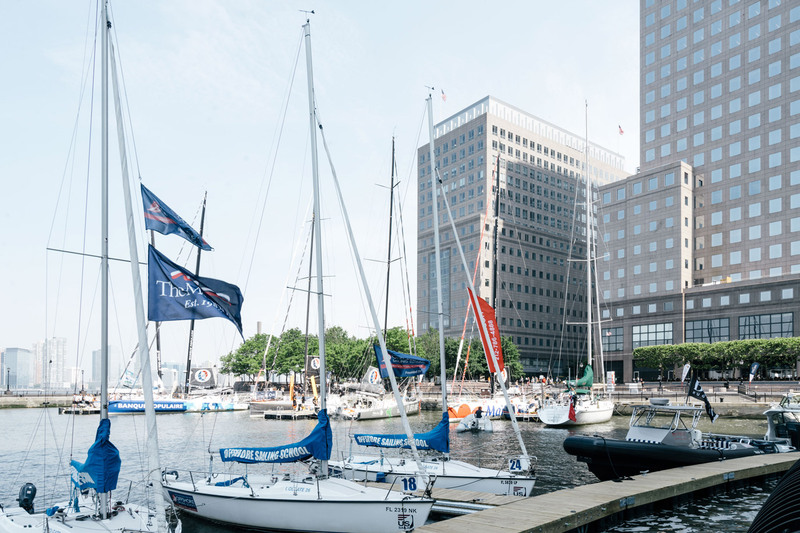 Residents of Battery Park City can also get free sailing lessons at the North Cove Sailing. The esplanade also links a string of kid-friendly parks like the creatively landscaped Teardrop and Rockefeller Park. The Skyscraper Museum focuses on high-rise buildings and celebrates the architectural heritage of the city and the people who created New York's skyline. It includes two spaces for both permanent and temporary exhibitions as well as a bookstore. If you're looking for views of the Hudson River try the nautical-themed Pier A. Located right on the water, the venue features an extended bar called 'Long Hall' as well as an Oyster bar. It's the ideal place to stop for a bite or drink after exploring Battery Park. With a mission to educate people about Jewish life in the 20th and 21st century, the Museum of Jewish Heritage has received more than 1.5 million visitors since it first opened. Designed by Roche-Dinkeloo the building is also a memorial to those who perished in the Holocaust. You can also take a trip to the Irish countryside without ever leaving Manhattan when you visit the Irish Hunger Memorial. Built to commemorate the great Irish Famine, the memorial contains stones from each of Ireland's counties and a reconstructed 19th century Irish Cottage. 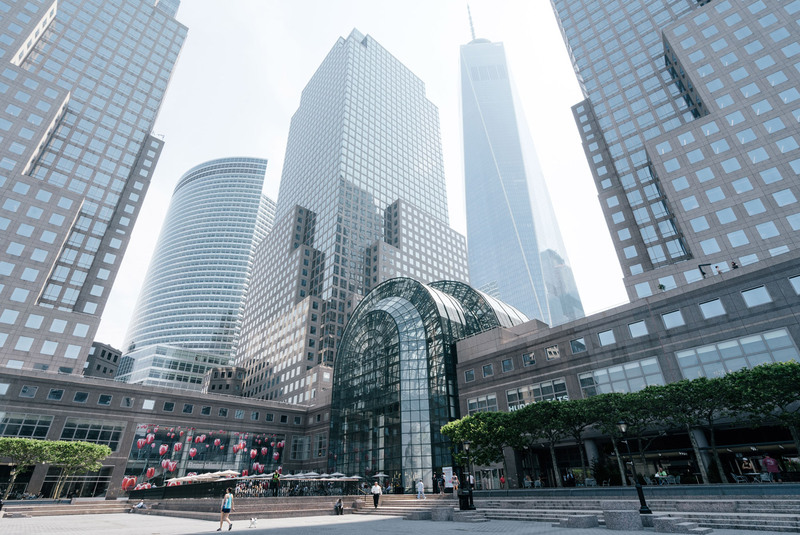 Shopping in Battery Park city is all about Brookfield Place. This waterfront plaza has something for everyone with a myriad of luxury stores including Gucci, Hermes, Burberry and Louis Vuitton, and is also a dining mecca with Del Frisco's steakhouse, Blue Ribbon Sushi, Financier Patisseries, and Sprinkles cupcakes among twenty plus dining destinations. Should you want to cook food rather than just eat it, the venue is also home to Institute of Culinary Education. As well as full-time courses, they have New York's most extensive program of recreational, cooking and baking classes. Merchants River House is a riverside restaurant with two outdoor terraces overlooking the Hudson River and the Statue of Liberty. This family-friendly restaurant serves moderately-priced American regional fare from an expansive menu. 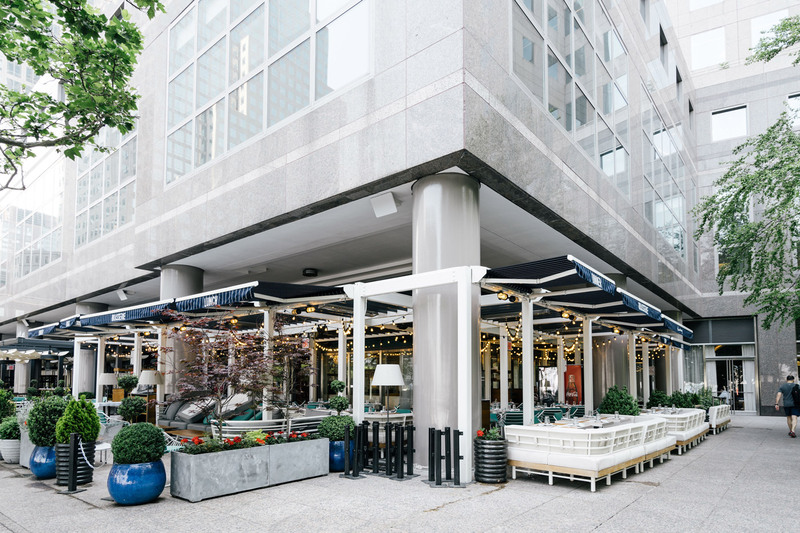 Located in the Ritz-Carlton hotel, 2West is an American steakhouse that offers an array of fresh local seafood and Certified Angus Prime Beef in a spacious, airy dining room with floor-to-ceiling windows. Danny Meyer's North End Grill showcases Emily Brekke's rustic French-inspired cuisine infused with smoke from the restaurant's wood-burning grills. The menu also includes a classic raw bar, charcuterie and seasonal produce from the restaurant's rooftop farm. Colorful El Vez presents a modern take on traditional Mexican food with dishes like the crowd-pleasing Macho Nachos which it accompanies with a choice of over 100 tequilas making it the ideal venue to visit with friends. Named after the flying boats that use to fly out of New York for destinations like Havana, Blacktail bar is on the second floor of Pier A and won the award for 'Best New American Cocktail Bar' in 2017. Inspired by Cuba's prohibition area cocktail bars, Blacktail celebrates mixed drinks from the 1920's to the 1950's along with reinterpretations of classic recipes. Dark wood and plush furnishings set the scene at The Black Hound, a contemporary speakeasy serving craft cocktails along with an extensive selection of wines, spirits, and local beers. You can relax at the white marble-topped bar or venture into a handsomely appointed back lounge to unwind on a sofa. Finally, Clinton Hall is considered the first beer garden in America and features 20 draft beers and ciders in constant rotation. It also has 20 styles of burgers made to pair perfectly with whatever beer you like best.